The Rump Parliament was brought to power in 1648 by Pride's Purge and forcibly dissolved by Oliver Cromwell in 1653. This book is a detailed account of the intervening years. 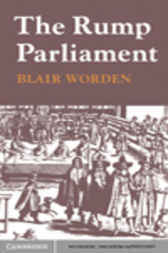 Dr Worden concentrates particularly on the Rump's policies in the contentious fields of legal, religious and electoral reform; its attempts to live down its revolutionary origins, to disown its more radical supporters, to conciliate those Puritans alienated by the purge and the King's death, and to re-create the Roundhead party of the 1640s. He examines the Rump's struggles for survival in the face of the Royalist threat between 1649 and 1651, and its fatal quarrel with the Cromwellian army thereafter. A concluding chapter deals with the Rump's forcible dissolution. This novel and challenging interpretation of the most dramatic phase of the English Revolution will interest all specialists in seventeenth-century political and constitutional history.